Well I'm back with a series to help all you writers out there. 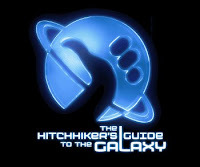 I'll be using that classic writers' guide and wholly remarkable book, The HitchHiker's Guide to the Galaxy. Packed with advice from poetry, how to pitch a book and dealing with the improbability of getting published this book has it all. Thought Stephen Kings' On Writing was the book to help you? Think again, it's rubbish compared to HitchHikers. Get that written into your contract when you get that publishing deal and see your sales and amazon ranking soar! I loved the "Hitchhiker" series, and the late, great Douglas Adams. It's nice that you can incorporate the "trilogy" into helpful hints for writers.